As I often do, before a trip, I was going through some images that I took last year on New Year’s eve. Like last year we’ll be snow camping in Yosemite for the holiday. The weather forecast looks promising, although honestly just being there is enough. I made this image at Valley View. The eastern sky was overcast and grey but there was a gap in the cloud layer on the western horizon. The gap allowed the days last light to reach El Capitan. Rather than take the image of the whole scene, which would have included the flat grey sky, I opted to frame just a reflection. I liked how the the three rocks formed an opposing triangle to the shape of El Cap. The warm light also made a nice contrast against the cold monochrome of the stream and snow. To make the image I used my Canon 5D with a 100-400L. I was zoomed all the way out, at 100mm, and set my aperture to f/22. I normally avoid settings narrower than f/16 because of diffraction but I need to slow down the shutter speed to get the look of the water that you see here. The resulting exposure was 1.5 seconds at ISO 50. 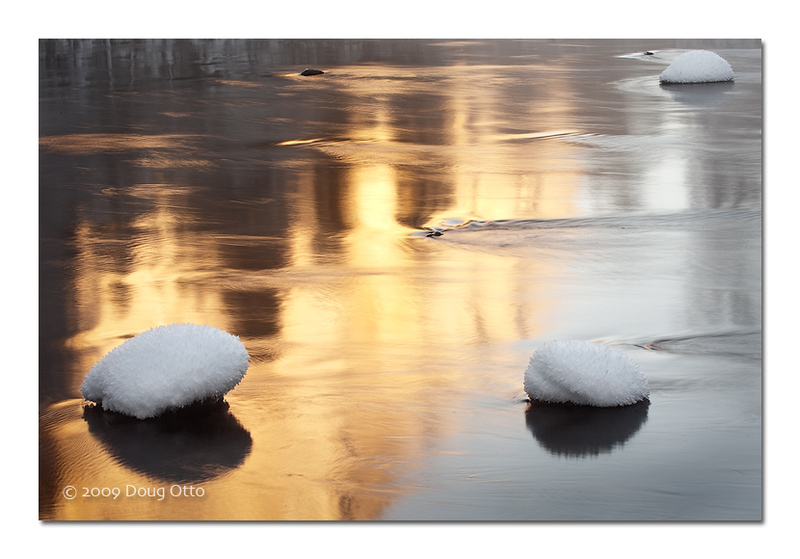 This entry was posted in Photography and tagged Canon 100-400, Canon 5D, doug otto, el capitan, Merced River, Photography, reflection, snow, yosemite, yosemite national park. Bookmark the permalink.